Rug Pad Corner is pleased to announce that its Super Hold rug pad was voted as best non slip rug pad in the thinner rug pad category. We don't compromise the quality of our Super Hold rug pad, which is why we refuse to use plastics, chemicals, glues or adhesives that others use. Rug Pad Corner, the nation's online source for quality rug pads, is pleased to announce that its Super Hold rug pad was recently voted as best non slip rug pad. Thousands of customers, to include homeowners, interior designers, architects and rug stores, have voted Super Hold as best thinner non slip rug pad based on a few criteria. "Unlike any other, our Super Hold is made of natural rubber, not a plastic", states Sam of Rug Pad Corner. "Many customers prefer the thinner non slip rug pad for specific reasons and they are extremely pleased when they discover ours is actually rubber." Sam explains that most people think of the thinner non slip rug pads with holes in them as rubber rug pads when they actually are not rubber. The bulk of the store bought rug pads that have the waffle look are made of plastic and are coated with adhesives. Since this type of rug pad may look and feel like rubber, people classify them as rubber rug pads. Thousands of customers were asked to rate Super Hold rug pad based on the comparison with the same looking rug pads that they had previously. The majority of the comments were based on the facts that Super Hold did not contain that popular chemical like smell in the home and it did not show itself imprinted on the floor. "Since Super Hold is only rubber without any adhesives, it will not out-gas or stain the floor", continues Sam. "Unfortunately, those lower priced rug pads will possess a strong odor and will eventually make their mark on the floor." Rug Pad Corner manufactures Super Hold rug pad in the USA of American rubber. The company stresses the fact that no adhesives, chemicals or glues are to be used to manufacture the rug pad. Based on this, Super Hold does not have a sticky feeling to the touch like other similar looking rug pads. The sticky feeling is due to the adhesives that are sprayed onto the rug pad. These adhesives are the same that transfer to the floor and cause hundreds or thousands of dollars in damage. "We receive so many calls every week about customers dealing with damaged floors from those inferior rug pads", comments Sam. "After they hear the facts about our all rubber Super Hold rug pad and why it doesn't damage the floor, they are always pleasantly surprised." Super Hold is available in all sizes and shapes and is very popular under smaller rugs or hallway runners. 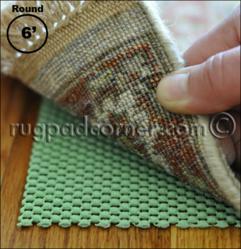 Rug Pad Corner stocks the rolls of Super Hold and cuts to every order as it is received. All Super Hold rubber rug pad orders are shipped for free within the contiguous United States.